Dave Frecklington has been frustrated by his squad picking up several injuries in a short space of time. Matlock Town’s injury jinx struck yet again in their uninspiring home draw with Mickleover Sports last Saturday. Central defender Chris Salt is the latest victim, helped off with a knee injury in the 24th minute which will see him join winger Craig King in missing the rest of the season. Jonny Margetts and Adam Yates both also picked up injuries and will require fitness checks before this weekend’s trip to Hednesford Town. It added to the frustration for manager Dave Frecklington in dealing with injuries week after week and there is barely a player in the regular first team squad during his tenure that has escaped the injury jinx. Frecklington is faced with a catch 22 situation this week with the transfer deadline being today (Thursday). Does he make more signings for cover, given more injuries could occur after the deadline, or give youth a chance and how many youngsters could he throw in to the hurly burly Evo-Stik NPL Premier Division at one time? Salt left the field in tears fearing a repeat of a previous ACL injury after landing awkwardly after making a routine clearance but he believes the injury might not be as bad as he first thought. Speaking in midweek Salt said: “I’m still really down but I’m still starting to believe it’s not as bad as I first thought. “I’m just waiting to get an appointment with the knee specialists to try and get a scan and see what’s wrong with it and take it from there. Salt had only been at the Proctor Cars Stadium for six weeks and had made an impressive start with the Gladiators. Frecklington shared Salt’s heartbreak. He said: “Forget the Mickleover game, I’m totally gutted for Chris, a top player and a top lad who gives everything every week and doesn’t let a game pass him by. 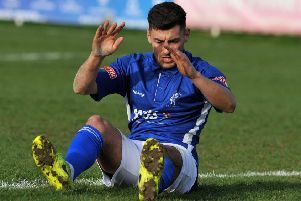 After only playing three times in March after the Hednesford match, Matlock face seven games in April with their squad stretched to the limit. Frecklington said: “It’s hard to bring lads in at this stage of the season for they’re hoping for contracts for next season. Player movement in and out of the club last week saw the departure of striker Luke Hinsley to one of his former clubs, Frickley Athletic, while forward Nyal Blake was signed on loan from Mansfield Town for the rest of the season.